A regional daily celebrated a double victory at last night’s O2 Media Awards Yorkshire 2017. 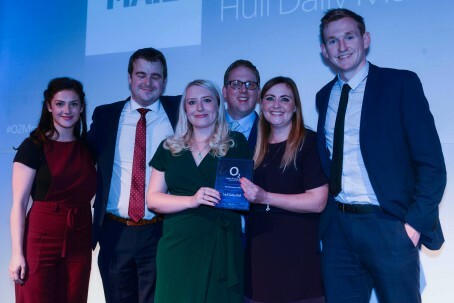 The Hull Daily Mail was named Best Daily Newspaper at the ceremony, while one of its journalists, Kevin Shoesmith, shared the Best Print News Reporter accolade with the Yorkshire Post’s Rob Waugh. The Post’s Rob Parsons also triumphed in the Most Memorable Print Story category for a piece on the Battle of Orgreave during the miners’ strike in 1984, while the Leeds-based daily’s Country Week section was named Best Magazine. Phil Hay, of sister daily the Yorkshire Evening Post, claimed the Sports Journalism prize, while Johnston Press Yorkshire commercial content editor Graham Walker took Online Journalist of the Year. The Whitby Gazette was named Best Weekly Newspaper. More than 200 journalists and media executives attended the awards in Leeds hosted by BBC Breakfast’s Louise Minchin.